LOS ANGELES, April 5, 2016 ─ In deciding not to prosecute Alexandra Griffin-Heady, 24, the owner of the pitbulls that killed her brother Tyler Trammell-Huston, 9, on January 3, 2016, the District Attorney of the County of Yuba, in Northern California, failed to follow the law, says leading dog bite law attorney Kenneth M. Phillips of Beverly Hills. According to published reports, Griffin-Heady left the boy alone in her mobile home with three pitbulls, two of which were confined in a wire cage. She knew the cage was breaking apart, the two dogs were dangerous, and the 9-year-old boy did not know how to be safe with them. Those dogs got out of the cage and fatally mauled the child while Griffin-Heady was absent for two hours. The District Attorney's press release on March 25th proves that he overlooked the real crime. It was not child endangerment. The young boy was savagely mauled to death because Griffin-Heady had dogs which she knew were “mischievous” and which she failed to confine properly. California Penal Code section 399(a) makes it a felony to keep a “mischievous” animal without ordinary care if it kills a person. “Mischievous” is a legal term that refers to tendencies which may naturally pose a risk of harm or injury to others. 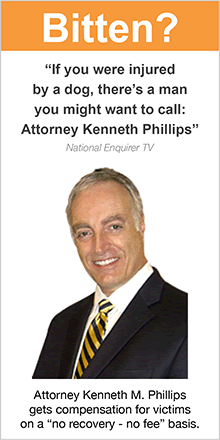 LOS ANGELES, April 14, 2016 – In a letter to California Attorney General Kamala Harris, Kenneth M. Phillips, the nation’s leading dog bite attorney, challenges Harris to take on the criminal prosecution of Alexandria Griffin-Heady, the owner of pitbulls that killed her 9-year-old brother Tyler Huston on January 3, 2016. On March 25th, Yuba County District Attorney Patrick McGrath announced he would not prosecute Heady on child endangerment charges. He did not address what Phillips calls "the real crime," which is negligently allowing a "mischievous animal" to kill a human. McGrath thus committed “an error unworthy of a first-year law student with failing grades," and therefore should be taken off the case, says Phillips. The legal definition of "mischievous" means unreasonably dangerous. Heady's pitbulls fit this definition, according to Phillips, whose law practice consists solely of representing the families of people killed by dogs and victims who are disfigured or disabled from dog attacks. He does not represent any of the parties involved in connection with the Tyler's death. On January 3, 2016, Tyler was killed by pitbulls belonging to his sister, Alexandria Griffin-Heady, 24. She left him asleep and alone with two pitbulls that were in a wire cage. The dogs previously had escaped from the cage. It had been breaking apart; Heady had applied a padlock on each door and single zip tie on its roof to hold it together. She knew the dogs previously had attacked her niece, were destructive, and that Tyler did not know how to be safe around them. When she returned three hours later, the roof of the cage was bent off and her brother savagely mauled. He died of his injuries the same day. "If McGrath had simply read the newspapers during the past 25 years,” says Phillips, “he would have known that the correct criminal charge was ‘keeping a mischievous animal that killed a human being,’ not merely endangering a child." 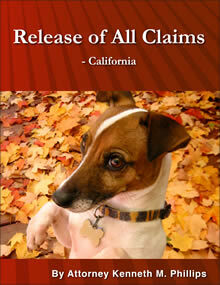 He cites four precedents published in law books where dog owners were convicted of the "mischievous animal" felony from 1991 on. The most infamous of these cases involved the 2001 death of Diane Whipple, who was killed by two Presa Canario dogs outside her San Francisco apartment. Marjorie Knoller and Robert Noel were convicted of the "mischievous animal" felony and Knoller also was found guilty of second-degree murder. The recall of the Jeep is a reminder that effective laws can and should be enacted to lessen or eliminate another source of preventable deaths and injuries: the modern pit bull. There are those who believe it is at least as important to fix the pit bull problem as it is to fix the Jeep problem. There are between 2.5 to 3.4 million pit bulls in the USA today. (Merritt Clifton, More adoptions will not end shelter killing of pit bulls, Animal People Online, June 18, 2013.) These dogs are responsible for 45% of all fatal attacks and more than half of all disfiguring attacks. (Clifton, ibid.) Attacks by pit bulls are associated with higher morbidity rates, higher hospital charges, and a higher risk of death than attacks by other breeds of dogs. (Bini, John K. MD; Cohn, Stephen M. MD; Acosta, Shirley M. RN, BSN; McFarland, Marilyn J. RN, MS; Muir, Mark T. MD; Michalek, Joel E. PhD; for the TRISAT Clinical Trials Group, Mortality, Mauling, and Maiming by Vicious Dogs, Annals of Surgery (April 2011, Vol. 253, Issue 4, pp. 791–797). It appears that the time has come for the big pit bull recall, at least metaphorically. If outlawing the dog is not politically possible, then let’s fix them, i.e., neuter them. This is a solution that has nearly universal acceptance. As stated in Animal People, “an effective response to pit bull overpopulation must target breeding, and must be legislatively mandated, since pit bull breeders have proved intransigently resistant to any and all forms of gentle persuasion.” (Merritt Clifton, More adoptions will not end shelter killing of pit bulls, 2009.) Ingrid Newkirk, the president of People for the Ethical Treatment of Animals, wrote in the San Francisco Chronicle on June 8, 2005, that PETA “encourage[s] a ban on breeding pit bulls.” Even a state like California, which generally prohibits breed-specific laws, allows local jurisdictions to pass “breed-specific ordinances pertaining only to mandatory spay or neuter programs and breeding requirements, provided that no specific dog breed, or mixed dog breed, shall be declared potentially dangerous or vicious under those ordinances." The intent of these laws is to permit cities and counties to regulate breeds by requiring members of the breed to be spayed or neutered. Like Chrysler agreed to fix the Jeep, the pit bull community should have decided to fix the pit bull. But that did not happen, and the sharp rise in mayhem and the number of these dogs seems to have ended the opportunity. At this point, states, cities and counties should enact breed specific laws that, at the very least, will prevent the breeding of pit bulls and thereby eliminate this clearly defective and destructive breed of dog over the course of time. “Dogs,” some would say. There are 76.7 million children in the USA this year, and 83.3 million dogs. (Federal Interagency Forum on Child and Family Statistics, America's Children: Key National Indicators of Well-Being; American Pet Products Association, New Survey Reveals Pet Ownership At An All-Time High.) In other words, there is one dog for every child in this country. That can mean trouble. So, as the school year comes to an end, one week in May is devoted to dog bite awareness. There are three good reasons for this. First, children are the primary victims of dog attacks (Centers for Disease Control, Dog Bite Prevention). Second, the number of dog attacks is growing every year (Kenneth M. Phillips, The Dog Bite Epidemic: A Primer). Third and most sobering, the severity of dog attacks has been growing too: hospitalizations because of dog bites have increased 88% over the past 16 years (US Dept. of Health and Human Services, Hospital Admissions for Dog Bites Increase 86 Percent Over a 16-Year Period), and the number of people killed by dogs has more than doubled in roughly the same period (Kenneth M. Phillips, Canine Homicides: July 2006 to the Present). Just last month, two toddlers in California were mauled by a friend's pit bull while playing in his yard. (Los Angeles Times, Two toddlers attacked by pit bull in San Bernardino County.) To Attorney Kenneth M. Phillips, the circumstances of the attack could have alerted the dog owner and the boys’ parents that something terrible could happen. 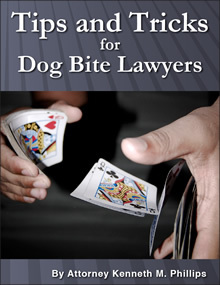 Phillips is the author of Dog Bite Law and represents dog bite victims throughout the USA, making him “the dog-bite king of the legal world” (Mike McKee, A Legal Career Goes to the Dogs: L.A. Solo Represents the Human Victims of Canine Attacks, The Recorder). A dog in its own yard, and no master present. 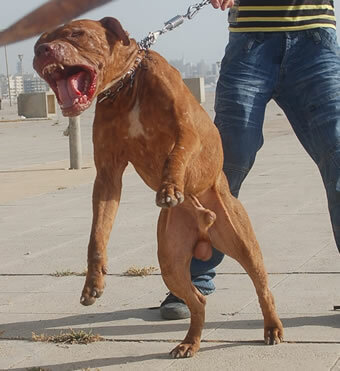 In 2012, at least 5 of the 37 fatal dog attacks happened in this manner. (Kenneth M. Phillips, Canine Homicides: July 2006 to the Present). The pack mentality. Three dogs are worse than 2, 4 are worse than 3, etc. Docile dogs often become uncharacteristically violent and vicious when they are in a pack. In 2013, 15 of the 37 canine homicides were caused by two or more dogs. (Kenneth M. Phillips, Canine Homicides: July 2006 to the Present). Joggers worry, parents worry, insurance companies worry: are dogs making our streets more dangerous with each passing year? This week a woman was mauled to death by a pack of 4 pit bulls as she went for a run in Little Rock, near Palmdale in Los Angeles County. In late April, another woman was killed by a pit bull in a Stockton, California, driveway. From the beginning of 2013 until now, a total of 13 Americans have perished all over the country as a result of dog maulings. Many wonder whether these killings are becoming more frequent and, if so, why. Perhaps the most shocking fact last year, he says, is that the majority of victims knew the dogs that killed them. “Twenty of the victims were the dog owners themselves, or their children, grandchildren, or parents,” Phillips says. 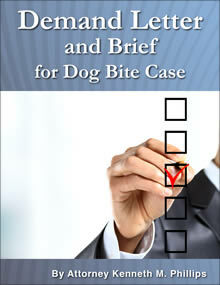 His website, dogbitelaw.com, contains summaries of all “canine homicides” from 2006 to the present. Breed and "parents" of a particular dog. There are aggressive breeds, and there are aggressive individual dogs that, if mated, can produce aggressive offspring. Socialization of the dog. In other words, how the dog has been desensitized to stimuli, especially stimuli produced by children. Poor socialization results in less inhibition to bite and engage in other undesirable behavior. Training of the dog. A dog that has been trained to threaten people is an obvious danger, but so is a dog that has been poorly trained or not trained at all. Health of the dog. When sick, injured, or in pain, even a friendly dog is more likely to bite. Behavior of the victim. This includes not just provocation but any behavior that can be misunderstood by a dog, such as a baby rolling over on a bed. 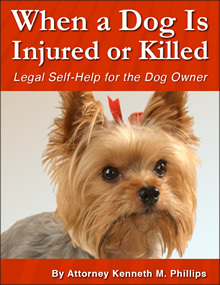 Over 1 million web pages mention “dog rescue groups legal liability” according to Google. The reason: dog rescue groups and adoption organizations are being held legally liable for dog bites. Being a non-profit, having limited resources, and doing good works are not grounds for defense when someone gets hurt. 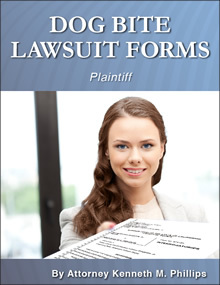 But there are steps that such organizations can take to protect themselves, according to Attorney Kenneth M. Phillips, the author of Dog Bite Law and owner of DogBiteLaw.com. Phillips talked about several of them on April 12, 2013, at the Santa Barbara - Ventura Veterinary Medical Association's mini-symposium for shelter and rescue groups. 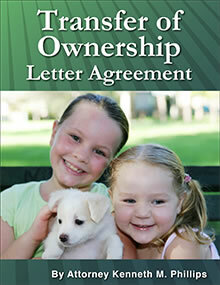 One such step is to avoid taking ownership of dogs that come into the shelter. 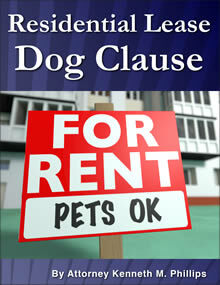 Phillips explained that owning a dog is the key ingredient for liability in states that have dog bite statutes. 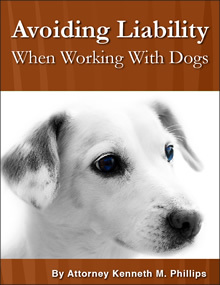 As he puts it, in those jurisdictions, “if you own the dog, you’re 'it'!” In other words, the owner is liable for bite injuries simply because, generally speaking, he is the owner of the dog. So, to avoid incurring automatic liability, he counsels against taking ownership. A “bailment” relationship is preferable. When the owner of property puts it into the hands of another person but retains ownership, the arrangement is referred to as a “bailment.” Adoption and rescue groups need to make it clear that they are nothing but “bailees” and not “owners” of the dogs in their custody. Another protective measure is a waiver form that is signed by people who come to the shelter to hopefully adopt a new dog. 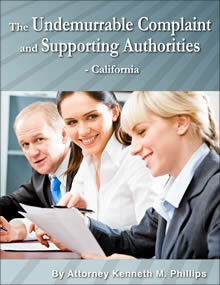 He explained that even laying out a room incorrectly can lead to liability for certain accidents. As an example, he told the audience about a client’s injury at a humane society office. The young woman brought her dog there to register it. The seats for customers were in the middle of the room. New dogs, fresh off the street (so to speak), were brought in from a door on her left, and taken out through a door on her right. When one such dog was led along that path, it went after her dog, which was on her lap. In the fracas that ensued, the woman’s hand was bitten severely, causing very serious damage. Phillips said he won a sizable settlement for her, in what he referred to as “the waiting room case.” The point of the story: have clients and customers sign waivers of liability when they enter the premises. A video of Phillips’ entire address to the symposium can be seen at the Dog Bite Law website.